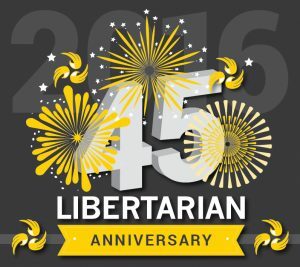 Today is the 45th anniversary of the founding of the Libertarian Party! Despite all the hurdles the Rs and Ds and their cronies have thrown against us, we have survived and grown for 45 years, and are now thriving like never before. There are reasons that we have only 2 dominant parties in the US. The hurdles for anyone other than the Rs and Ds to attempt to compete are just so high that most won’t try to leap those hurdles or fight back against the system. But we are vigorous and making great progress! If a Secretary of State gets creative in their interpretation of the law and challenges our paperwork, we fight back. If our candidates are discriminated against by the Commission on Presidential Debates, we fight back. If states pass laws aimed at suppressing us, we fight back. We don’t win every battle, but we are winning the war, by outmaneuvering our opponents and having the courage and strength to stand our ground and persevere. This year, our Presidential candidate achieved 3 times the previous record number of votes. This year, our election results were able to secure 2018 ballot access for us in 37 states plus DC. The previous record was 31. That’s a 20% gain and a huge boost for us as we pursue gaining access in those remaining states for 2018. Our name recognition is better than ever before. Our candidates are better known than ever before. Our press coverage is more substantial than ever before. Our membership has grown. Our fundraising has skyrocketed. Our founders, most of whom have since passed away, dreamed of the LP achieving this kind of robustness. So, as we mark the LP’s 45th birthday, let’s reflect on the courage of our founders, who dared to challenge the status quo in such a revolutionary way. We proudly carry their torch.